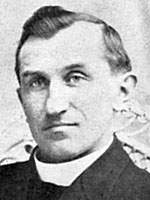 Father Paul Matthias Dobberstein was born in Rosenfeld, Germany on September 21, 1872. He received part of his early education at the University of Deitsche-Krone in Germany. When Paul was 20 years old he immigrated to America. On coming to America he entered the Seminary of St. Francis near Milwaukee to prepare for the Priesthood. It was there that he began to show signs of unusual artistic ability that was to characterize all the waking hours of his earthly existence. He completed his studies for the Priesthood at St. Francis Seminary and was ordained there on June 30th, 1897. Holy Days of Obligation as reported in the bulletin. The Grotto is frequently considered the “Eighth Wonder of the World” and The Iowan magazine has described the Grotto as a “Miracle in Stone.” The location was placed on the National Register of Historical Places in 2001 and has been included in such features as Roadside America and Disney’s The Straight Story. A composite of nine seperate grottos, each portrays a scene in the life of Christ. The largest man-made Grotto in the world, the Grotto contains the largest collection of precious stones and gems found anywhere in one location!